The new release of SAP HANA 2.0 SPS03 is around the corner and we are excited to explain our new features. In this blog, we are specifically going to look into SAP HANA XS Advanced Cockpit. This will replace the old SAP HANA XS Advanced Administration Tools, which is announced as “Deprecated” in this release. We will refer to SAP HANA XS Advanced Cockpit as XSA Cockpit and SAP HANA XS Advanced Administration Tools as XSA Admin Tools in this blog. One of the major reasons for us to move to XSA Cockpit is to provide users a consistent, unifying user experience in cloud and on-premise. The XSA Cockpit includes all functionalities of the XSA Admin Tools and it also provides a lot of additional capabilities. The UX and design of the XSA Cockpit is very similar to the SAP Cloud Platform Cockpit to provide users a seamless experience in the cloud and on premise. Before we dive deeper into the new features, let me briefly explain how to install and access the XSA Cockpit. For those of you installing SAP HANA 2.0 SPS03, XSA Cockpit will be automatically deployed. For customers already using earlier releases, you need to install using the XS command. Log in to the SAP Support Portal and click on Download Software. Now you can search for the products you want to download and enter “SAP HANA Platform Edition 2.0” into the search term. Choose the second one, which is the maintenance product, as shown in the image below. You can then click on XSA Cockpit to download the zip file and once the download is complete, install the XSA cockpit by executing the command xs install <zip-file-name>. Then run the xs apps command to determine the URL of XSA Cockpit and launch it in your browser. In SAP HANA 2.0 SPS01 we provided a preview of XSA Cockpit with basic functionalities such as organization and space management, and in SAP HANA 2.0 SPS02 we included authorization management and now in the SAP HANA 2.0 SPS03 we provide all the functionality of XSA Admin Tools within the XSA Cockpit and a lot more. The below image shows us a screenshot of the XSA Cockpit. The user that is logged in here has the admin role, and hence this user is allowed to make all the CRUD operations on organizations. Based on the role of the logged in user, a selective enablement of UI elements will be displayed. 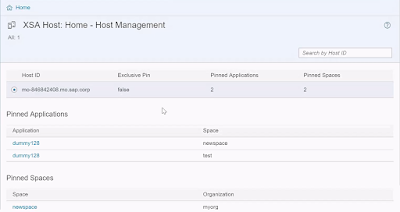 Similar to the SAP Cloud Platform Cockpit, on clicking on an organization we can see the spaces assigned to this organization as shown in the following image. We can also notice that the tabs on the left navigation panel are different because we are now at the scope of organization level. We can navigate back to the Home level scope using breadcrumb. And by choosing any of these spaces, we can see the list of applications deployed in a particular space. The details of application instances, memory and disk limits are displayed here. We can view some additional information by clicking on the Monitoring tab from the navigation panel. The additional capabilities within the XSA Cockpit compared to that of the XSA Admin Tools include the possibility to browse though the Service Marketplace as shown in the image below. Using the Service Marketplace, we can choose a service and create service instances, which can then be bound to applications. The Service Marketplace also includes user provided services. Now, let’s navigate back to the Home level to view the Security capabilities. Under the Security tab, we can create and maintain role collections, trust configurations and trust certificates. The trust certificates along with their status can also be seen in the below image. The XSA Cockpit provides the Tenant Databases tab for creating a new tenant database, enabling them for XSA, and mapping them to an organization and/or space. This can be done on the same page of the XSA Cockpit as shown below whereas in the XSA Admin Tools this was provided under two separate tiles. 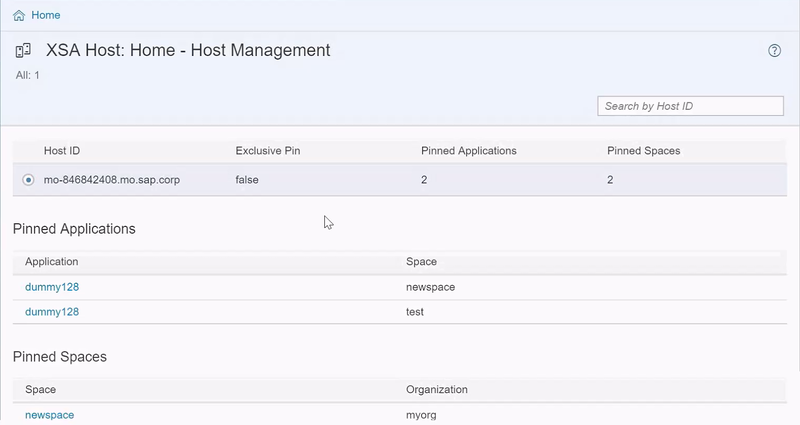 The Host Management tab shows an overview of the different hosts on which XSA is running. As we are currently running a single host system we see only one host in the image below. Nevertheless in multi-host installations, we will be able to see different hosts along with the pinned apps and spaces within a host. Under the User Management tab we can create and manage users. And all further functionalities such as viewing audit logs, managing application lifecycle are included in the more tab. Additionally in every page of the XSA Cockpit, there will be panel-help button that explains details about the current page and the option for users to directly create support tickets, if necessary. These are shown in the following two images. The XSA Cockpit is also integrated into the SAP HANA Cockpit and SAP Web IDE. With the SAP HANA 2 SPS03 release, on choosing the Administer XS advanced option from the SAP HANA Cockpit, the users will be informed of the deprecation of XSA Admin Tools and will be provided the option to either choose XSA Cockpit or XSA Admin Tools. But going forward in the future releases, the possibility to use XSA Admin Tools will not be supported. And, of course we included the XSA Cockpit into SAP HANA, Express Edition too.